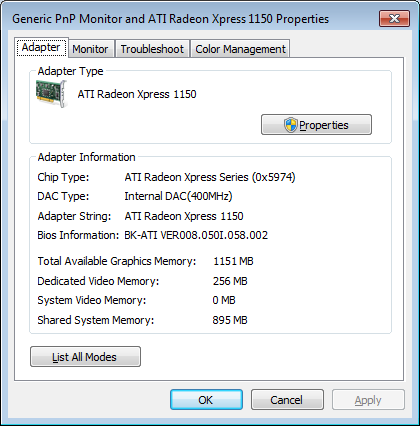 If you’re reading this, you’re probably running Windows 7 in 800×600 or 1024×768 resolution with a default PnP monitor even though you’ve got an ATI graphics card that supports higher resolutions. 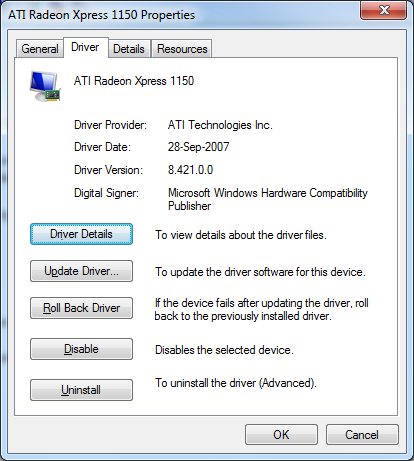 ATI was quick enough to release Windows 7 drivers for higher-end cards which you can download here but if you try to install the setup with an older graphics card (such as an ATI Radeon Xpress 1150), the setup fails to install because the graphics card is not supported. I wasn’t surprised, as my graphics card wasn’t mentioned in the release notes of the Windows 7 drivers but I tried installing the Vista equivalent (Catalyst version 9.3) hoping that would work, which unfortunately didn’t. Without these drivers, you can’t load screensavers, use Aero or use taskbar previews and the display appears slightly blurred. I found a solution by using an older driver (so old that it isn’t even mentioned on ATI’s Older Releases page) and although the Catalyst software didn’t work, the display driver works fine and I can use Aero, view taskbar previews and pretty much do everything else. You will need to download ATI Catalyst Driver version 7.11 for your card to work properly with Windows 7 which you can download here for the 32-bit version or here for the 64-bit one. 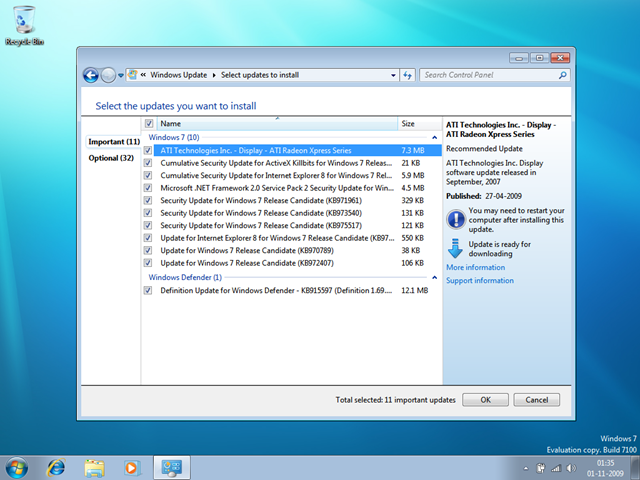 Although the drivers are for Vista, they will work for Windows 7 as well. I haven’t been successful running a higher version of ATI’s drivers, so let me know if you’ve succeeded running a higher version. Windows 7 RC boots faster and even runs slightly better than Windows XP and I haven’t had problems with application compatibility so far and I advise you all to give it a try. I was forced to reinstall Windows 7 RC for irrelevant reasons, and this time Windows 7 automatically downloaded the driver for the Radeon Xpress 1150 Card after the OS setup was complete. 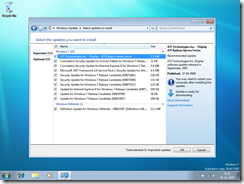 The update appears as a recommended download in Windows update and although it states that the driver publish date is 27th April 2009, the actual driver is version 8.421.000 and was released in September 2007. The driver installed by ATI’s 8.12 Catalyst setup is version 8.561.000 which was released in December 2008. Games work perfectly fine and so does Aero and Aero Peek although I personally feel that games ran noticeably faster with the v8.12 driver. Also, the pre-startup screen logo animation is not displayed with the default driver that Windows installs. Still, I recommend updating the driver to version 8.12. I haven’t had the opportunity to try this on the retail version of Windows 7 yet, but I’ll update this post as soon as I do. 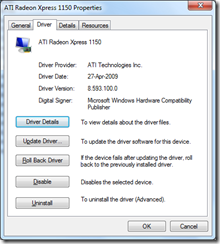 If you use DriverMax, it suggests a newer driver for the ATI Radeon Xpress 1150 having version 8.593.100.0 released on 27th April 2009. I guess this was the driver that Microsoft intended to bundle with its Windows update (read Update 2) so I went ahead and installed it. The driver worked fine until I started a couple of games, which is when I noticed that this driver cannot resize the screen to a lower resolution. What it does instead is reduce the resolution of the game instead of the screen. For example, I chose 800×600 resolution for a game and instead of resizing the screen, the driver maintained the usual 1280×800 resolution for the screen and reduced the game to 800×600 resulting in the game taking up only a small portion of the screen. After uninstalling the driver and reverting to the previous one, everything was back to normal. Moral of the story: DO NOT install version 8.593.100.0 !!! That works really fine. I’m surprised and have no idea why that works, but it does. Thank you very much! 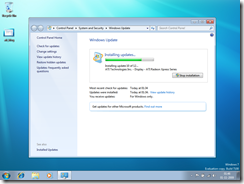 I’m going to try this for my x1650… for the life of me i can’t get it to update. Same no device found error. Aero and all that works, my big issue is I need Catalyst Control Center for scaling on my HDTV. That’s weird. I have a Dell Vostro 1000 Notebook and it worked just fine. 8.12 works for me as well. Thank you so much, you have done wonders. I appreciate your searching. I’ve just managed to (relatively) painlessly install Catalyst 9.3 on W7 RC, using the Mobility Modder (http://www.driverheaven.net/modtool.php). Uninstalled all old drivers first, downloaded 9.3, modded it using the tool, and ran the install without even having to use compatibility. It threw an error at the end, but the driver works fine anyway. At least, I think it does. Device manager reports driver version 8.591.0.0, which is right I think, and it hasn’t crashed yet! Thanx Dude it works I m very thankful to you!!!!!!!! Thanks for some very useful information. Loaded 8.12 on a 64-bit Vostro 1000 with Ultimate 7. Graphics significantly improved and the Control Centre works as well. UPDATE 2:I have fnished testing various setups and it is the drivers that was preventing the image in lower resolutions to be strech to full screen. It is therefore my conclusion that drivers 9.1 and 9.2 work fine on higher or full resolutions but at less resolutions they do not stretch the picture to full screen. Hence, if you are gamer stick you 8.12 under Windows 7 for X1150. Thanks, Sonny. I had no idea about the stretching issue. I have been using Version 8.12 for my Xpress 1150 in a hp nx6325 notebook, it works fine apart from running accelerated flash in fullscreen mode (youtube et c) which periodically crashes the display driver (which does reset nicely). Disabling acceleration in flash stops the crashes but puts a lot of load on the CPU. Has anyone else experienced this? Is there a fix? Yeah, I experience the same issues and so far I haven’t found any fix for it. Let me know if anyone finds a solution. The youtube fullscreen crash is annoying. Wow! Great work figuring that out! I was about to switch back to vista because i couldn’t use my ATI graphix. everything looked fuzzy. Everything works fine now! I wish AMD would release a new 32 bit and 64 driver for our graphics chip. Especially as this chip is not older than 5 years. AMD classifies this as a “legacy” card which is strange to me. I wish they release just one driver for people like me and many others who have only used AMD for the past many years..
i used the 7.11 version and it does work, thank u for your useful info. Thanks man!! it works great! The animation on my Windows 7 boot screen doesn’t work?!! It just starts and the orbs start to come together to from MS logo but it freezes after 1 sec.. the OS continues to boot and I can work fine but thinking the animation freezes coz of these drivers.. anyone else experiencing this with 8.12? I think it’s work. tnx man! Is anyone else getting a BSOD? I get an error like “ati2dvag.dll has caused an infinite loop” Never happened in Vista..
Nope, everything works great except the YouTube fullscreen issue. What is your laptop configuration? wow!!! that’s great information!!! i struggled to get it to work and didn’t managed to do that until i read your article. thank you!!! but when i installed windows 7 oem on my dell 1501 then aero effect r not there…it work well in RC so what i will do for final version…anyone else try it on final version…. Thanks so much for posting this!!! I’ve upgraded my Dell Vostro 1000 to Windows 7 64-bit and it’s like I just bought a new computer!! SO MUCH better than Vista 32 bit!!! Only problem was the slightly blurry graphics but now you have made my day!! I downloaded version 8.12 for my radeon 1150 system and aero peek did not work still…my system is hp nx6325. I checked my laptop with windows7 adviser. it said that Aero effect and Xpress x1050 compatible. there isn’t error about graphic. I hope that it works fine. In order to stop me getting NT Kernel & System running at 50%, I had to drop my ATI Radeon 1150 drivers back to 8.12 as suggested. This was after an install of Windows 7 64bit Professional. Its works fine, thanx for the solution! Now, does anybody have a fix to get the Catalyst Control Center to work in Win7 with a Radeon Xpress 1150? I do need the scaling that the CCC offers. I mean, it worked right away when I installed the latest Vista drivers.. So… dunno, Catalyst works too. Glad it worked for you. I checked the links though, and they work fine. I’m running 8.561.0.0 on my dell inspiron 1501, no problems yet. interfaces with my tv instantly. I’m having some trouble getting my tv to act as a second monitor though. Anyone know if 10.2 works better? Anyone tried to play Call of Duty/Call of Duty:United Offensive? My 8.12 drivers work fine but there is extreme flickering when I try to play these games.. Thanks alot for this! , i was looking for ages for a working video driver , this did the trick , keep up the good work! Thank you very much. This allowed me to actually go to bed last nite and not stay up banging my head against a brick wall (tnx Dell)…. Now if only I could get the battery to co-operate! Thanks a lot, man..it worked for me!!!! Gracias…. tengo mi laptop inspiron 1501 y solo me faltaba el driver de video para tener completo mi SO. Thanks!!! I have installed the 8.12 driver and also had the youtube / flash player freezing when watching movies full screen. I was already accepting this. But then by a coincidence I have installed the Advanced System Care Professional software and for my surprise the fullscreen videos started working!!! So this could be a solution for you as well. Hope it helps. Zoomer … thanks a lot man, u are great. Keep what are u doing to help many guys like me. I`m from Roumani, whit an Inspiron 1501 (Dell), that ATI made me crazzy! Thanks again man!!!! Not sure where you left off on this. At the top you say that the 8.12 is noticeably faster. So as far as I can read betweent he comments and the top post the best option is—–> Use ATI 8.12 nothing changed….OR use DNA 8.12 All other options are compromised. Is there any reason to play around with 8.593? Another question….why not just use the 10.2 ATI legacy package? Because of the full screen on games etc? v8.12 refers to the Catalyst Control Center version. The actual version of driver that gets installed is 8.592. The only thing I noticed about 8.593.100.0 was a slight decrease in overall responsiveness (compared to 8.12) and the “no full screen on games” issue. I think above you mean 8.561 as what gets installed with the 8.12 package. I have located this file, look at the bottom on the May 10th, by Shakeyplace. Its a mobility modded version of the legacy package. This install will actually put on the Catalyst contol center, with tall the color and 3d tweaks. I then confirmed or installed that that I was using the 8.651 because of your testing of its speediness. Thanks, in my DELL-Vostro1000 (AMD-Turion) install this “ATI Catalyst Driver v7.11” for Windows 7 and solved my problem. My problem was that the brightness of the screen was very dull, very dark and could not use activation keys the brightness of the screen, but with this new driver improves the graphics and enable puder activation keys brightness screen. Hi Born2Code, Thanks a lot genius man, after reading your post i was confidently upgraded my Acer Ferrari 1000 series laptop from Vista to Windows 7 and the graphics of computer works perfectly. I have one favor to ask from you, how can i fix the camera(Acer LogiTech OrbiCam), it doesn’t work with Windows 7, your kindness and expertise is highly appreciated. please any body tell me how to install a driver to ati readon xpress 1150. I install 8.12 driver also but it dosent work. I have hp compaq dc5750 small form facter. please reply as soon as possible…..! The solution I found is easy. I have had the Center Problem with “Blade Runner Game”, and the latest Legacy Driver. Switch CCC to Basic Mode, then choose Display Properties and then “Go” Button. 7.11 driver was perfect… now my Youtube videos will run full sized without a blue screen crash, too! Thank you! I installed the ATI Driver and it works just fine. I have a hp compaq dx2250 in which some games like gta andreas dont run with the 8.12 driver, in win 7 ,32 bit but these games run in win xp. what should i do to run these games? Muchas gracias por la solucion!!! I needed to compose you the very little word just to say thanks again for your personal gorgeous ideas you have featured above. It has been certainly unbelievably generous with you to provide unreservedly exactly what a few individuals could possibly have offered for sale as an electronic book to help with making some profit for themselves, certainly since you could possibly have done it in the event you desired. These smart ideas as well acted like a fantastic way to realize that some people have similar passion just like my very own to find out much more with respect to this condition. I’m certain there are millions of more enjoyable periods ahead for many who examine your blog. I think this website contains some really wonderful information for everyone : D.
You, sir, are a gangster. Thanks for saving me a lot of time – time better spent with alcohol. the links available in this search were only for vista and xp . will the drivers for vista also works for windows 7. Great info, thanks a lot, worked fine; these ATI drivers are great except when there is a problem like this one. Had to search for the new link, has there been a Wpress update? I didn’t know where to turn after updated my drivers. Luck for me I found your blog and realized my issue was incompatibility with windows 7. This blog was an answer to prayer. I’m up and running fine now. Much nicer than getting a blue screen. Thanks! Thanks so much. The 8.12 version solved my video driver problem on an old Dell laptop my daughter uses running Windows 7. Really appreciate your blog. I recently loaded Win 7 x64 (along with 4GB Ram) on my old Dell Vostro 1000, which has the old Radeon Xpress graphics. No problems with drivers whatsoever. Windows automatically found them all, and everything is running smoothly including youtube videos. I didn’t have to download any catalyst software. After you install Win7 x64 just let windows update do it’s thing – at first the desktop will look crappy and low-res, but after a couple of restarts and updates it runs smooth as silk. No problems with youtube either. I watched a tonne of HD (720p) latest movie trailers to really test it, and everything was fine. I guess 5 years ago this was not possible, but now (2015) it seems windows update has finally figured it out. Super! Driver work in WIN10 too! Great Thanks! Super! Driver work in WIN 10 too! Great Thanks! Ok I have a friend with a dell vostro 1000 and has had xp installed for about 8 years, I’ve now made it a dual boot with windows 10. Problem is that whatever graphics driver I install, the splash screen doesen’t show (I mean the splash screen which gives you the option to either boot in to windows 10 or xp when you first switch on your laptop). I can select the OS blind but thats not good enough! In the end I had to change the boot order of the automatic startup OS from windows 10 to xp which also changes the splash screen to a boring one thats not as pretty but doesn’t rely on the graphics driver, now I can see the splash screen. So if you want to dual boot xp with vista/7/10 change the startup OS to xp (I changed mine by right clicking on my computer and going to propertys then select advanced system settings, then select the setings button for start-up and recovery). Or I beleive you can also change this via the splash screen its-self if you select the advanced options but I’ve never tryed it this way. 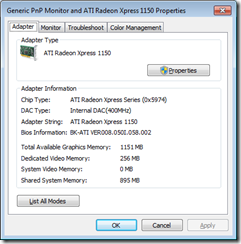 What ATI drivers work on the Radeon 7500 graphics card?